- Fertilize with Milorganite (organic approach to feed the soil as synthetic only feeds the plant) or apply spring application of Orgo (1/2 -3/4”). - 1" of rain per week (all the same time instead of spread out over several days). - Late June for grub control and various insects, apply Bayer Advanced All Season Grub Granules. - Cut tall fescue grasses 3-4" in height during the late spring/summer/early fall. - Make the most synthetic fertilizer applications in the fall. For my flowering perennials, I apply Epson salt and Jobes Organic Rose and Flower Fertilizer. For insect control, from all my experience, Bayer Advanced 3-in-1 Insect Disease and Mite Control Concentrate, 32-Ounces is the one to get. greens up the lawn like no other. Hard to believe, but just about 3 months away. Lawn is actually still rather green for beginning of January. I've gotta stock up on Milorganite after lasts years drought. It's my fertilizer of choice, but seems that some July/Aug it was hard to find. I may have to wait until March or so to get some as right now it's ice-melt, shovels and snowblowers. I have many weeds - violets, clover, crabgrass, and whatever in my lawn. I have tons of bees visiting my weeds - especially the clover. I have groundhogs and rabbits nibbling on my lawn, weeds and all. I have a variety of birds eating fat, juicy worms that live in my lawn. Frankly, I think all grass lawns are sooo boring and without purpose. That is also my plan, get Milorganite sooner than later this season. Snow blower is collecting dust at this point. Beginning of January and not even an inch of snow. 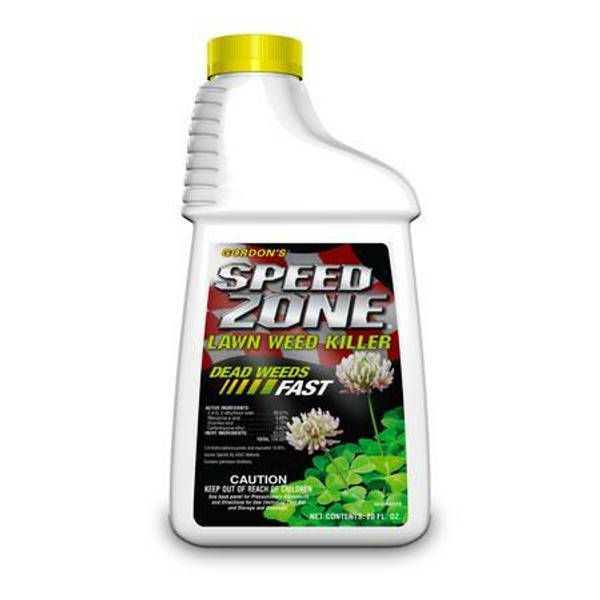 Need to order a new bottle of Gordon’s Speedzone, had amazing results with this product last season. Of these are political and economic forces rather than free choice, culture, and consumer demand. Please don't politicize lawn care. There's a forum for that already. In the book Lawn People: How Grasses, Weeds, and Chemicals Make Us Who We Are by Paul Robbins, the lawn and a “myriad of other objects of daily life, constitute who we are” (p 15). Our modern concern with appearance and social status is reflected on the appearance of our lawns. Robbins argues that there are several influences that turn someone into a “lawn person”. Of these are political and economic forces rather than free choice, culture, and consumer demand. Not the appropriate place for this. Please consider removing it. If you want to debate the topic of lawn care chemicals, please do so with your own dedicated thread. Hijacking another poster's thread is not acceptable here. Mine is floating away! Soooo much rain lately. I've had to "dedicate" a pair of shoes just to walk in the lawn as they get soaked and muddy now. I neglected a bit last year, and also complied to my neighbor's complaints about the stink of the alfa and soybean meal. I have clover issues now in the back yard and thinning a bit. I don't really like my neighbors anymore, so I'll be coating my lawn again with the soy and alfalfa again soon enough. I have plenty of the sprays left over from last year to go again this year, thankfully. So weeds and crab grass shouldn't be a problem again. Will certainly do another round of the Bayer tree/shrub treatment again this year (stuff worked great). I did overseed and feed in the fall, will see how that comes up in a few months. But, 100% going to throw down more fescue seed and a ton of the alfalfa and soybean meal again this spring. Going to get my golf ball trick back! Probably cost me around $500 or so for the lawn itself. Still stuck on big items at the moment though. This year's outdoor ticket item will be the addition of 14 Thula Green Giant trees while removing 3 crape myrtles, 3 baby blue spuces, and 1 weeping cherry that the deer are using as dental floss. Going for complete and total privacy for our side and back yard now (we're a corner lot). I have a wholesaler who can get me the Thula's at 7-8 feet tall for about $75 a tree, and a landscaper who'll charge me about $40 a tree to install, along with reworking some of the lines on the irrigation system. All-in, probably around $2k to get it done. Sorry but its really not acceptable how that stuff washes down the storm drains and contaminates the drinking water pollutes the lakes and rivers red tide algee blooms ect. All I am all about liberty and to each his own that's great but that doesn't include poisoning everyone else in the process. I was done anyway. But since I am already typing this thread is funny, make your lawn "the envy of the neighborhood" lol the last thing I envy is a toxic waste dump for a yard. The number one symptom of narcissistic personality disorder is constant need for admirations "my lawn!" look how great I am. This nonsense with the yard poison should be something of the decades past when we did not know better. Maybe I will start a thread. This thread looks like it was started by Bayer the new owners of Monsanto ! Happy trails amigo. Watch out for the lime disease.